Ruolan Han - Our Newest Teacher! 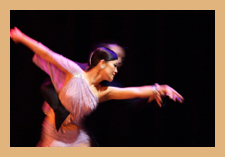 Ruolan Han has over 10 years of experience in Ballroom dance, being trained mostly in International style Ballroom 10 dances and American Smooth. She has also been trained in several other dance genres including ballet and Chinese classical dance. Ruolan has been performing on stage with several performance groups and dance companies in a variety of dance styles since very young age. She is passionate about dance and enjoys sharing her knowledge with students.